What can I say? I hated taking shots... HATED it. I hated the lumps under my skin, I hated the bruises, and I hated the burning. It was the worst. I tried two oral medications, one of which I had a reaction to and couldn’t continue. The other, I gave my honest-to-gosh best try. I set alarms. I tried to make sure I had it on me at all times. I gave what we could call a valiant effort, but I kept forgetting the second dose. And, worst of all, the side effects never stopped. That oral medication made me physically feel terrible, and when the medication you’re on makes you feel like garbage, it is really easy to justify why you don’t need to take it. As a result, I would often not take the medication, which just furthered my compliancy issues. I reached out to my doctor to talk about these side effects and he gave me a few ideas to help. However, even with those suggestions the side effects were pretty unbearable and in the end, I stopped taking it all together. It’s not like I go out of my way to be noncompliant, but the current meds on the market make it pretty easy to justify skipping a dose, whether it be injection site reactions, or requiring multiple pills a day. For the greater part of these last 10 years, not only have I been noncompliant, but I have also pretty much just been medication-free. About once every two years, I write a blog post about how I’ve changed my mind, and I’ve decided to be good about taking a medication, and I try really hard for about a month and then it all goes down the drain. Part of the problem is the aforementioned issues with medication side effects, but the other, more important, problem is that I feel fine. I have, for the most part, been in remission and feeling awesome. I’ve been hiking in deserts and now I play roller derby; overall I’ve pretty much just been giving MS the bird and going on with my life. But like many times before, I have started to wonder whether or not I should be taking preventative measures because the reality is, it won’t be this good forever. So then I talk myself into taking a new med, and then repeat the cycle over and over again. Until now (hopefully). About two months ago, I started teriflunomide (Aubagio) because in regard to my noncompliance, it was the easiest medication for me to work into my life. But really that just means that teriflunomide hasn’t given me any reason not to take it... yet. Teriflunomide is a once-a-day oral medication for relapsing remitting MS, and so far, it is the only one I’ve been able to stick to. Now I have to give full disclosure here, and that is I really only remember to take it like once every other day but I am actively TRYING to make sure I take this tiny blue pill, and I have to say that my efforts are paying off. I am getting better at taking it, and that actually feels pretty good. So why has teriflunomide worked for me? What don’t I like aboueriflunomide? Potential long term effects? I haven’t had my liver checked yet, but that could be what causes my break-up with teriflunomide. The stupid blister pack. It doesn’t come in a bottle, but rather a blister pack and I always seem to have a hard time opening it. 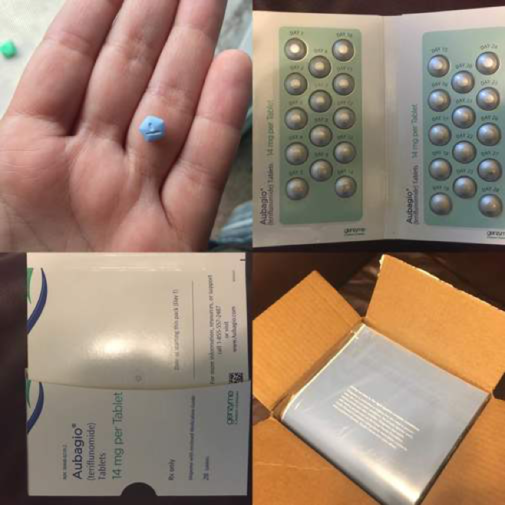 Pro tip: If you struggle with your pack, rip off the whole cardboard back, which makes removing the pills much easier. Is this an endorsement for teriflunomide? No way! This is an endorsement for you to find a medication that works well for you. We are lucky enough to live in a time where there are multiple options for medications, and many of us get the choice of which one we want to take. I was honest with my doctor about how I felt about injectables and how I would likely be noncompliant again if I were prescribed another one. I also explained to her that my previous neurologist wanted me to take natalizumab (Tysabri), despite my very mild case of MS, and how that made me very uncomfortable. I am fortunate that I have found a neurologist who listened to me and heavily involved me in the decision about my future medication. I am actually very lucky in finding her, because the number of neurologists I could see in my network was very small. I felt really limited with my options and expected this doctor to be just like the others who didn’t listen in the past. Unfortunately, it seems like finding a good doctor is just the luck of the draw these days. Too many times on this journey, I have had doctors tell me what to do without explanation or with an explanation that I didn’t understand. I found that my neurologist truly listened to me, and engaged me in an actual conversation about my options, and the pros and cons of each option, and we came to an agreement together. I am hoping that, with my neurologist on board and a medication that makes it very easy for me to take it, my chart will soon read “compliant.” I’m hoping that I can feel good about my medication choices, and even a slight sense of pride in continuing to take it. As my doctor explained to me, “The best medication for you, is the one you will take,” and she is right. If you’re on a medication that makes you feel terrible or you often forget to take, you’re not reaping the benefits of that medication anyway, and it might be time to consider a different one. Remember you’re in the driver’s seat with your medical choices, and that you have every right to ask for an alternative choice and/or change your mind! Can Diet Stop the Progression of MS?